The Turquoise Trail in New Mexico: Between Hippies, blue rocks and round corners. Colorful wind chimes are jingling gently in the wind. The sky is stretching across horizon like a blue canvas and rough rocks are dragging jagged shadows into the chapped asphalt. The Turquoise Trail in New Mexico cuts into the enchanting landscape of red rocks and sandy shrub-steppe on a length of round about 65 miles. 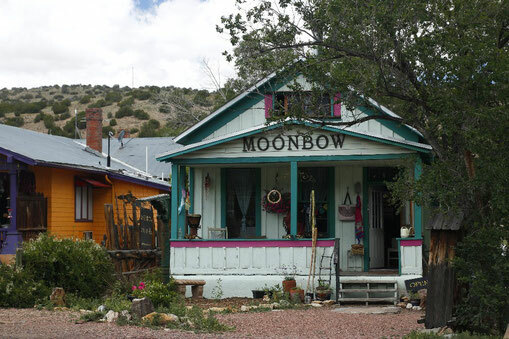 Small historic villages are hiding behind hills and corners on the route between Santa Fe and Albuquerque. You’ll find cute museums, arts and crafts – and especially treasures made out of turquoise! This is a road trip far away from big Interstates. It’s a road trip where timelessness becomes the clock. You can start on Turquoise Trail in the direction of Santa Fe or Albuquerque. It doesn’t matter, both directions are beautiful. My trip is beginning in Santa Fe. This city is more than 400 years old and a jewel made out of adobe. 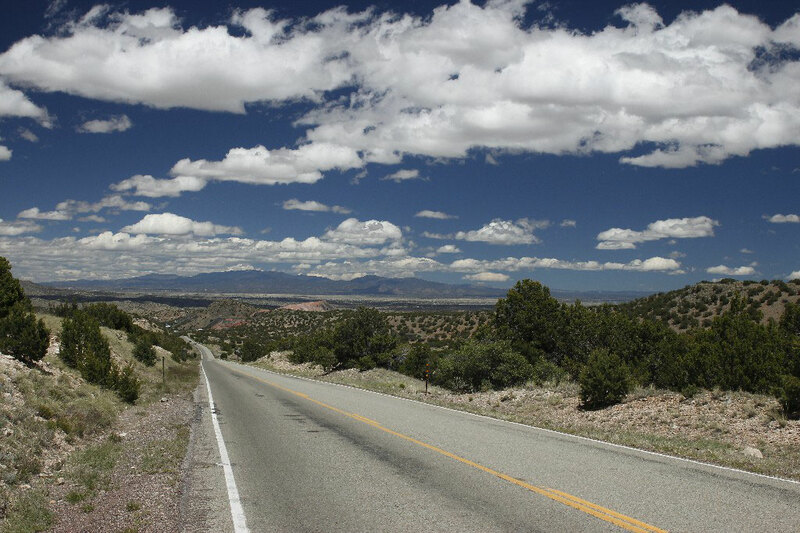 To me Santa Fe belongs to the most impressive and outstanding places in the world. 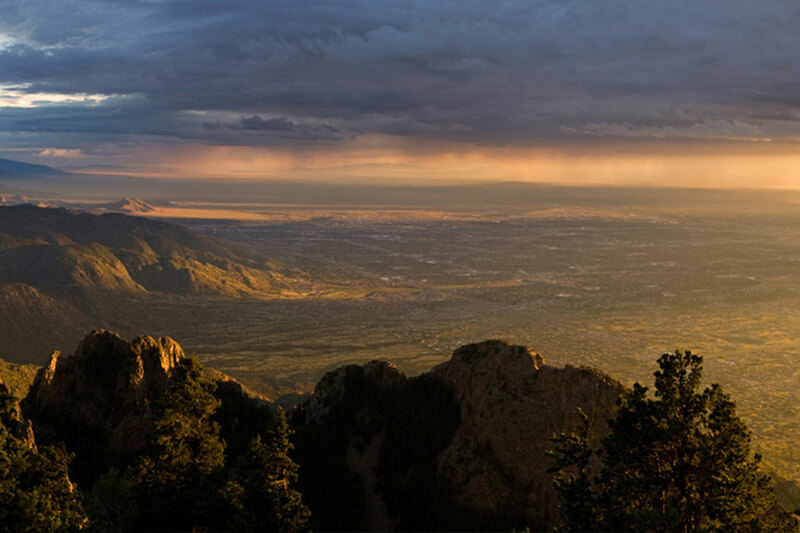 Although it is the capital of the state New Mexico with a population of 90.000 people it never appears as a big city. The whole town looks much more like a small charming historic district. 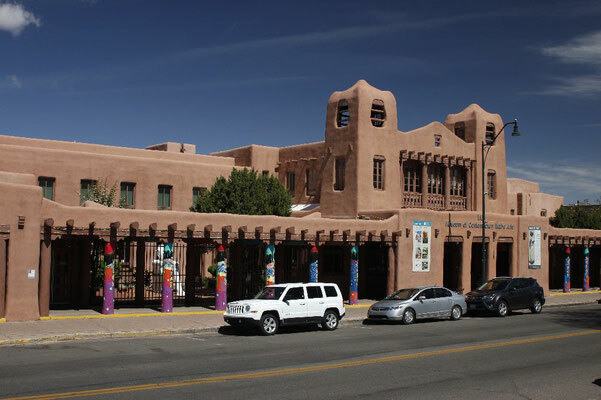 Most of the houses were built in the warm and brown Pueblo Revival style. In 1912 the urban administration stated that new buildings need henceforth to be constructed in this style. Even today the city still covers “modern” architecture with this kind of technique. From Santa Fe the Turquoise Trail follows the small Highway 14 out of town. The trail is open year-round and you’ll find road sings saying “Scenic Byway” everywhere. While driving, I’ve got always problems with following street signs without crashing into them at the same time. So I just typed “Los Cerrillos” into my GPS. By doing this you’ll catch Turquoise Trail automatically. Shortly after you’ve left Santa Fe the plain steppe with its grey-green grassland is starting to burst out to the endless horizon. White clouds are laying on top of the landscape like on a table. 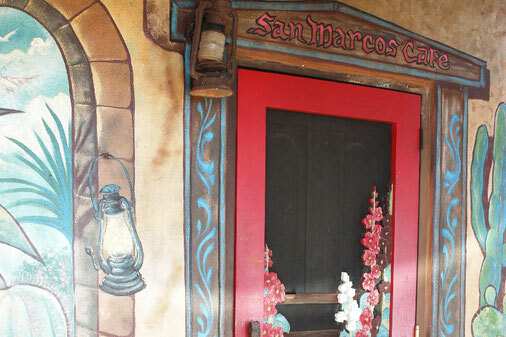 You can do your first stop at San Marcos Cafe & Feed Store. Painted flowers are entwining around the colorful wooden door. The warm wind is affecting a small red dust devil in the air. If you haven’t been covered yet: You’ll find a nice map of the Turquoise Trail and tasty cinnamon rolls inside. 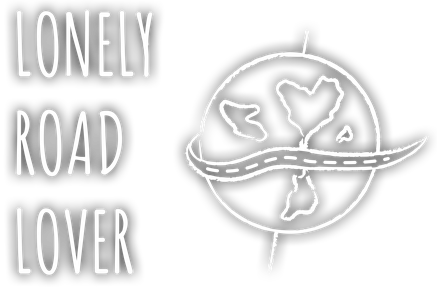 You can also find gas stations along the way. But it’s more relaxing and cheaper if you gas up in Santa Fe or Albuquerque. Now you’ll head on to Los Cerrillos. The mining area there is one of the oldest in the US! When I hear the word “mine” I always think about coal, darkness and dirt first. But in this area they mined turquoise. The first minerals were mined by early Pueblo people around 900 A.D. Today you can find lots of crafts and jewelry shops along the trail and buy beautiful artworks made out of turquoise. In some shops you can visit and talk to the artists themselves. By stopping in Los Cerrillos you can visit the Mining Museum to learn more about the history of the blue and green stones. My personal highlight on Turquoise trail is the stunning village Madrid. 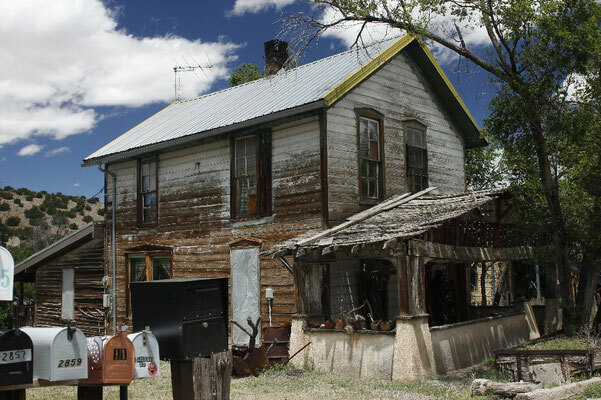 After the golden era of mining the place started to become an abandoned and dusty ghost town. 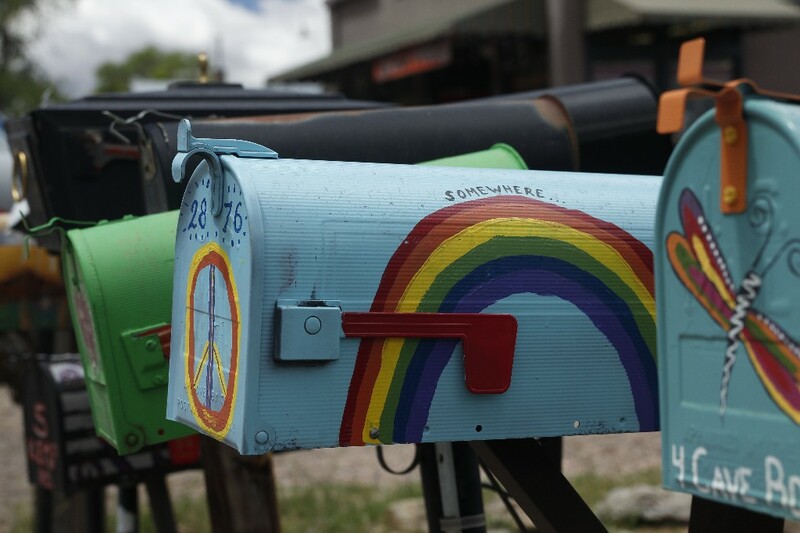 Hard to imagine while I’m passing colorful potteries, pretty wind chimes and mailboxes painted with rainbows. That’s only because hippies and artists came back to Madrid in the 1970s to revitalize the city. Find very tasty and huge scoops of ice cream at Jezebel Gallery and be enchanted by the unique orange landscapes and sheep made out of bronze at Indigo Gallery. The people there are extremely friendly and answer all the questions you have about their art and their life around Turquoise Trail. I recommend planning on two hours in Madrid. It’s only one street but full of magical stuff. From Madrid follow the road into the mountains. The highway is winding up red rocks and your breath will be taken away and caught by the thorns of green cacti. You simply have to take a look into your rear mirror. Stop at one of the lots along the street to touch the rough asphalt and enjoy the colorful infinity of this overwhelming landscape. You won’t forget this beauty in a lifetime. Some time later you’ll reach Golden. We’ll, what’s left of it. The name does lie. The only thing that still holds the fort is the picturesque San Francisco Catholic Church. By reaching San Antonio you should do a sidestep from Highway 14 and turn on Highway 536 in the direction of Sandia Park and Sandia Crest. In summer, you can hike around there and in the wintertime you can even go skiing. No matter what time of the year it is you can always enjoy the view from the top of the Sandia Mountains: Watch Albuquerque from above by sundown. The highest point is 10,678 feet. You can reach it by driving a 13-mile long and winding but well-developed road. Down in the valley a very curious and cute museum is waiting for you. 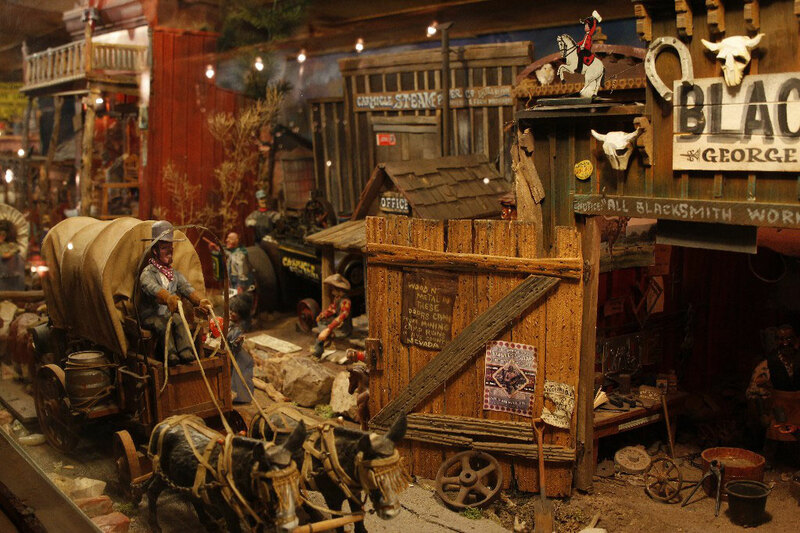 It’s the Tinkertown Museum. Old western cities appear as midget villages. Handmade wooden figures start to move their old limbs as soon as you throw in a quarter. It’s a magical cabinet and great fun not only for kids! By the way: At a feeding station close to the entrance I spotted my first hummingbird. I was giddy with excitement. 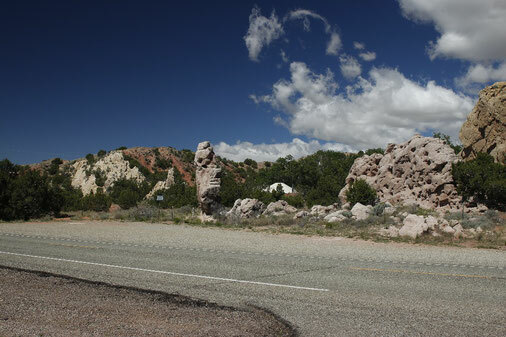 The last stop on Turquoise Trail is Tijeras. Round about 500 people are living here and you’ll find a visitor center with information for hiking in the Cibola Forest. By leaving Turquoise Trail in the direction of Albuquerque you’ll meet parts of the Historic Route 66! 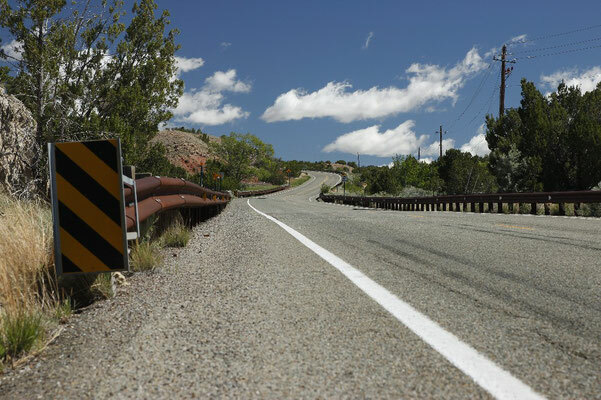 You can make your road trip on Turquoise Trail in one day. Even if you stop by several times to visit museums and galleries. Only if you need much more time to visit every shop I recommend planning on two days. There are some Bed & Breakfasts and also campsites along the trail. But the B&B’s are around $150 per night. So to me it made more sense to stay the night in Albuquerque and Santa Fe. For exploring these big and interesting cities I would highly recommend planning on one or two extra days in each one. The route is suitable for RV’s. In the summer it can get hot and dry on Turquoise Trail. In the wintertime it’s possible to have snow and frost. So I would advise you to come in spring or autumn for doing this road trip. Have you been to Turquoise Trail yet? Tell me about your experiences, impressions and favorite shops! Do you have any further questions about the road trip? Simply message me because I know much more about it than I could put into this article.